This beautiful, multicolored beaded bag will add the perfect finishing touch. The beaded exterior and looped fringe is made up of translucent glass seed beads in a versatile rainbow of light-reflecting, sparkly color - pink features predominately. The bag is lined with a golden chamois fabric and trimmed at the frame with a wide pink, gathered ribbon. There are no interior pockets. The purse measures approximately 7" long including fringe (5 1/4" long from the top of the frame to the purse bottom) by 5" wide by 5/16" deep. The brass frame features a simple, etched wavy design edge coupled with fretwork at the top edge of both sides - it appears beaded but is actually the hand stitching holding the interior fabric to the frame. The brass, long and short oval link chain measures 11 3/4" with a drop of 5 1/4" and does not fold in to make a clutch. The acorn kiss lock clasp works perfectly. Total length of the piece is 12 1/4" from the top of chain to the bottom of fringe. 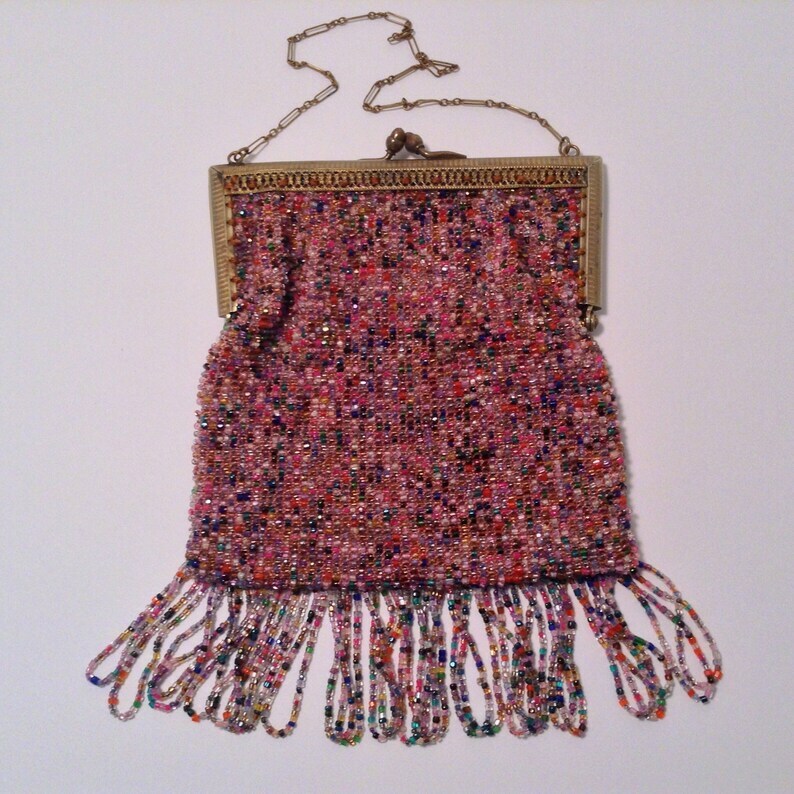 This purse is in excellent vintage condition with no loose and /or missing beads, tears, holes, fraying or odors. The interior fabric is intact with no stains and very little rub wear near the clasp (see photo three). There is some tarnish to the chain in a couple of spots, on the clasp and on the frame as well – very little and nothing that seriously detracts (see all photos). One loop of the beaded fringe is slightly longer; another slightly shorter than the rest (see photos one and five). Love it and use it joyfully!